It was with great anticipation that I boarded the plane from Cairns to Sydney on Saturday November 23rd 2013! After months of planning, all was now finally in place for the four SOS ~ Sounds of Source events which would take place North , South, East and West of that beautiful city. The following account cannot really do justice to the magic that took place. As has been the case with every city or region I have visited, each of the events were totally unique and special. And none of this of course, could have taken place, without the support and dedication of the four beautiful Sydney Hosts. The Sydney experience was a little different from all the other cities to date, in that I had two over-seeing angels with me throughout! Sabine Kaldor and Lilo Kuntz were responsible for much of the overall logistical planning, and they also travelled with me to all four events. I cannot overstate what that support meant to me. 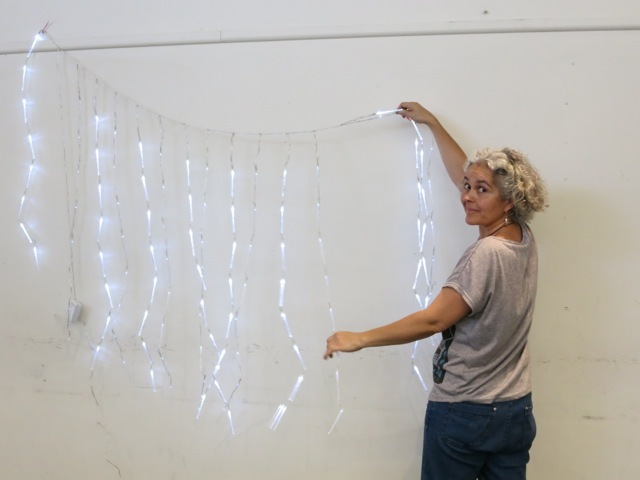 The physical and emotional demands of mounting events in four separate venues within a very short space of time, on top of doing the actual presentation itself, can be challenging to say the least! So, having these two gorgeous women with me every step of the way, helping me to set up and pack up, took an enormous amount of pressure off me. An added bonus was that Sabine and Lilo are both of Swiss origin, so everything was done with great efficiency! By the time the fourth event came around we had become a real team and the whole practical aspect worked like clockwork! Thank you again, dear Sabine and Lilo. 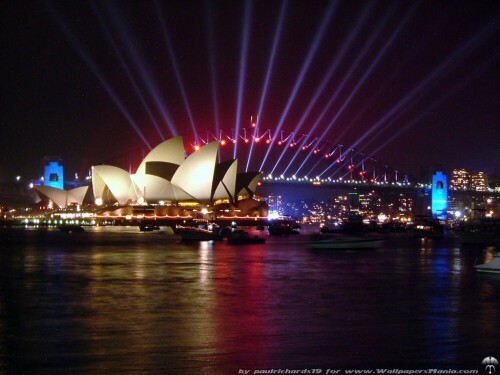 Our adventures together began on the day I arrived in Sydney. The three of us had agreed to meet to get to know each other a little better, and to plan our schedule in advance of the first event which was due to take place the following day in Annadale. 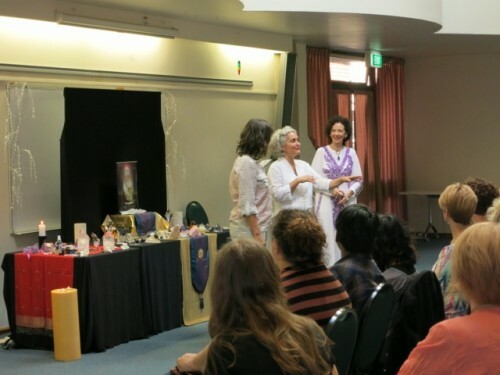 What began as a meeting to sort out the practicalities, evolved into a powerful healing experience for all three of us. 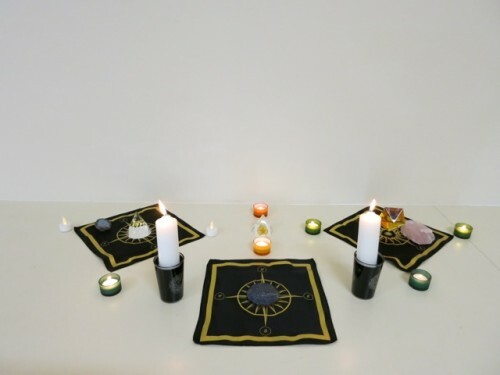 As we sat around the round table in my rented appartment, I was guided to anoint Sabine, Lilo and myself with the high frequency oils of ‘White Angelica’ and ‘Joy’. Then, with hands joined encircling the lit candle in the centre, we called on the great power of Source to be with us. 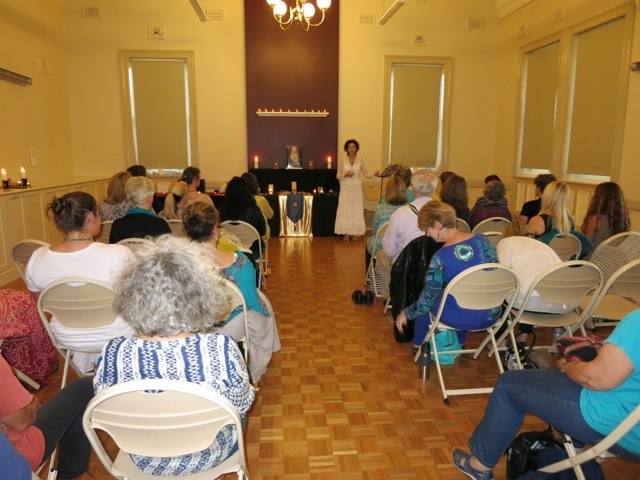 We asked for assistance in anchoring this Sydney SOS ~ Pillar of Light with ease and grace, and sent out an urgent call from our hearts to all who were meant to be there, to hear the prompting of their soul. We received an immediate sign of confirmation that our prayers had been heard! Sabine’s eyes fell on two large stones on the bookshelf which beckoned her insistently! When she placed them in the centre of the table we laughed with amazement and delight, for there deeply etched into the two stones were written the words ‘Hope’ and ‘Love’. I placed the bottle of ‘Joy’ beside them to complete the visual manifestation of the trio of intentions we now had for these upcoming events. We envisioned Hope, Love and Joy descending on every single soul who attended. When we met at the Annadale Neighbourhood Centre the next day we were bubbling with excitement! 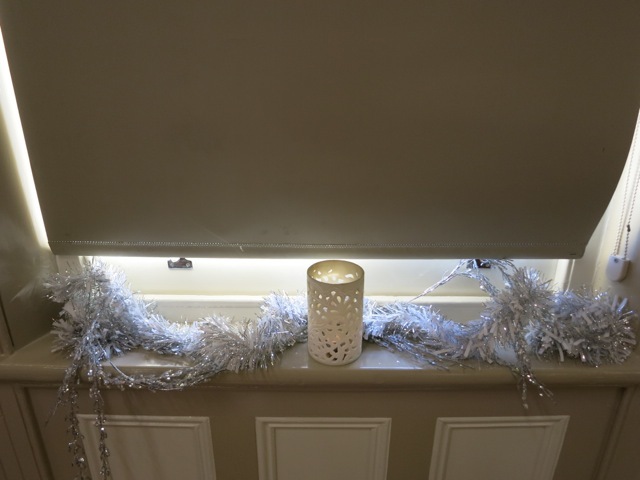 I was thrilled with the space – a very large, high ceiling-ed room with two beautiful Victorian fireplaces. I saw at once that we could make it very special. 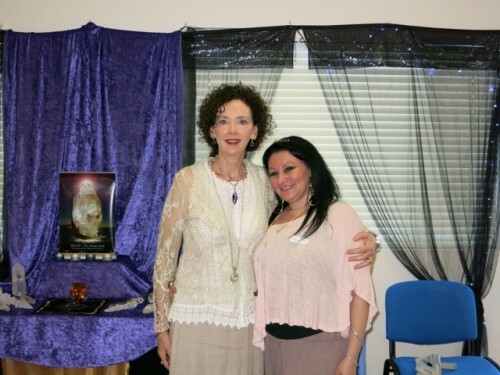 Sabine and Lilo had come laden with all sorts of lovely things to help beautify the room, including some magnificent cut crystal energy generators. I was excited too by the arrival of the shipment of the new pure silk Source Stone Altar Mats I had commissioned, and at the prospect of being able to use them for the first time to honour the Master Source Stones that would encircle the attendees. 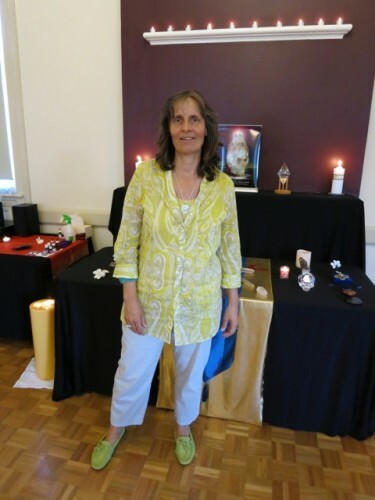 By the time the set-up was complete the space looked magnificent – a truly sacred place for people to enter. 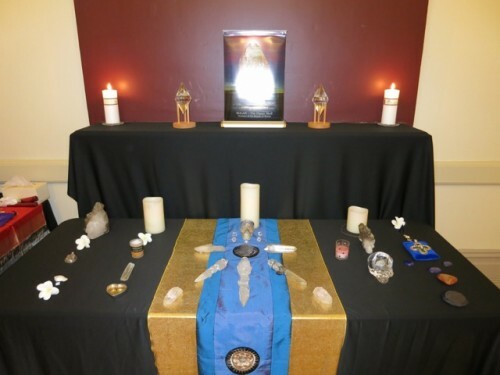 I know it was a trick of the light but I think it indicative of the power of The Master Skull Solar’s presence, that his image in the poster on the altar appeared as a blazing ball of White Light! 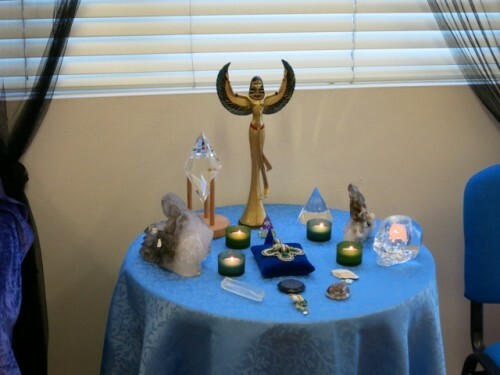 When I stepped through the door of the room again that evening to begin the proceedings, I found myself engulfed in an incredibly sweet and joyous Angelic energy that permeated and filled the room, and I knew in that moment, it was going to be a very special night. And so indeed it unfolded, as The Master Source Stone amplified and projected the sacred sound frequencies from Source, to all present. Nobody seemed to want to leave when the event was over! Many stayed on to chat and enjoy the company of like-minded friends, old and new. What has been common to all the Sounds of Source events, is that they seem to engender a great feeling of Community. By partaking in and contributing to something that has not just local but global significance, I think we find ourselves easily bound together with a sense of Sisterhood and Brotherhood. 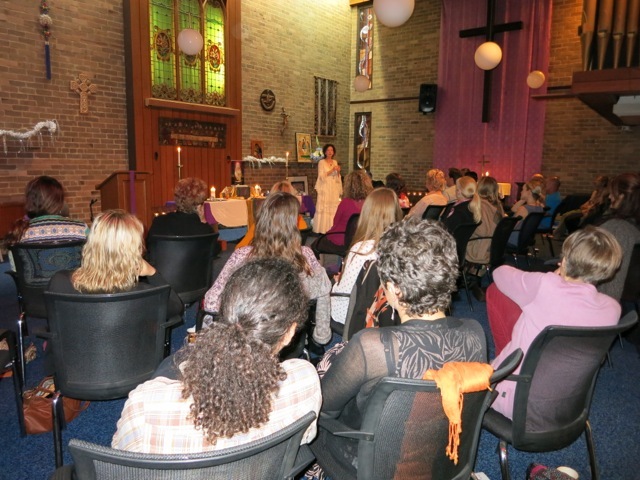 The second event scheduled for Miranda in Sydney’s South, was hosted by Rosie Shaloub of Embrace Australia in her friend Janine Donnellan’s ‘Soul Searcher’s Spiritual Centre’. With a free day before the event and not having met Rosie in person before, I decided to make a surprise visit to her beautiful shop in Miranda’s Westfield shopping centre. 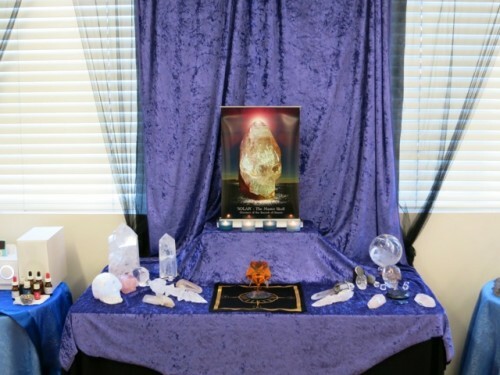 Wow…what amazing crystals she has on display there! I could have done a runner with several of them!! When I think of Rosie I think ‘pocket rocket’ – she is tiny but powerful! Rosie had ’embraced’ the whole idea and purpose of the Sounds of Source tour with such open-ness and generosity of spirit, that I knew we would get along like a house on fire….and we did! Apart from the opportunity to meet Rosie and her team before the actual event, I came to realise that there was another purpose for this unplanned trip to Miranda. As soon as I hit the road my channel opened. I understood at once, that I was trailing the ‘Sounds of Source’ energies between the venues, just as has happened in every other region I’ve visited. I believe this serves to strengthen and anchor the Cardinal Point circuit of Light, bringing it into completion and full circle. On leaving Miranda on that day, again without any specific advance planning, I found myself driving back to the city via Annandale. Our evening at the ‘Soul Searcher’s Spiritual Centre’ was of course, very special. One of the wonderful things about the Sounds of Source Tour for me has been meeting some of the beautiful people who have followed and supported my work for many years. At Miranda I met several such people. 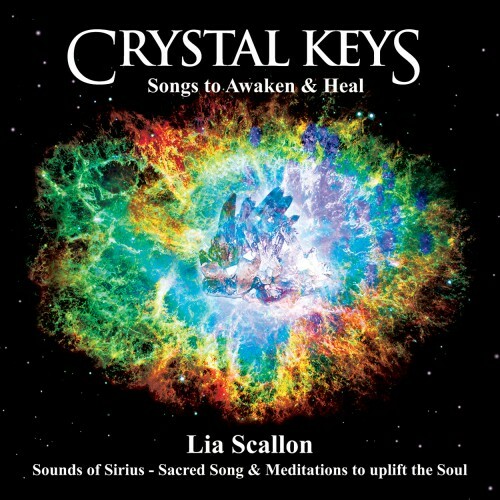 One of these to my great delight was the talented Spiritual graphic artist Leanne Williams, who designed the Front cover graphic for my last award-winning album ‘Crystal Keys’. I have featured much of Leanne’s art in my newsletters through the years too, but this was our first opportunity to actually meet in person! The third of the four Sydney events took place at Sydney’s iconic Bondi Beach. Once more, as soon as I stepped into Sabine’s car for the drive to the venue, my channel opened, a download of powerful energy surging through me. In the midst of the sacred songs and the Light Language flowing through, I instinctively began to call in many specific Light Beings, as well as the Ancient Ancestors of the land. As we began our descent into Bondi and caught sight of the ocean, I began calling urgently to the Whales and the Dolphins. Then came a clear instruction that we needed to encircle the venue with this energy before entering. The Bondi event it seemed, had already begun! 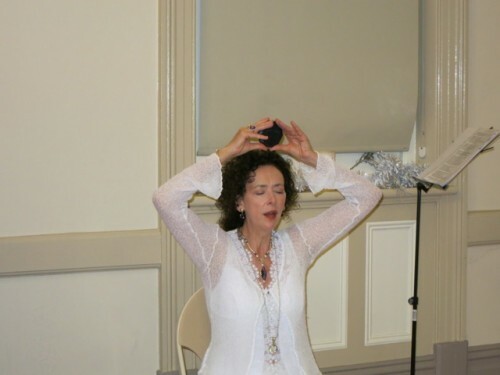 Sabine found a way through the busy streets to circle the Chapel whilst I channelled continuously, feeling the energy rise and build with increased intensity. It was clear that this was going to be a very important gathering. 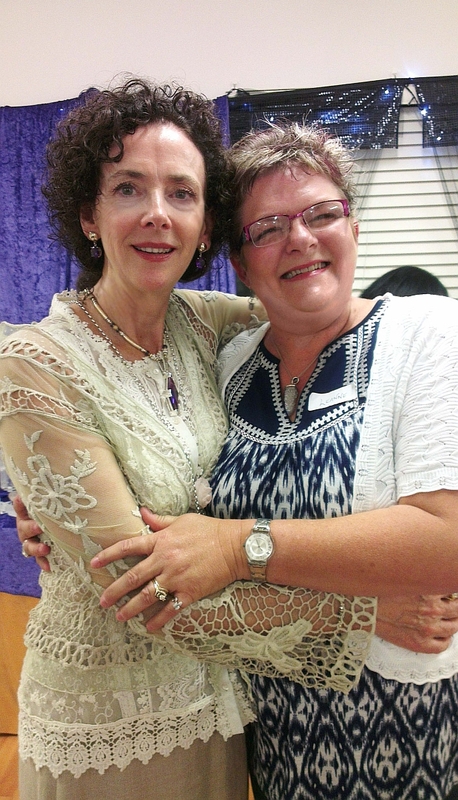 The host for this evening was Anji Millar – a therapist in Lila’s Massage centre as well as her friend. Anji is a beautiful and vivacious soul who has the ability to brighten any room with her presence! And this was quite a room! 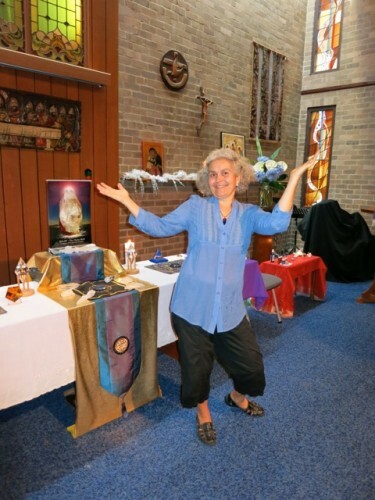 The Chapel by the Sea in Bondi is just that – a non-denominational sacred place, one street back from the ocean, which hosts a wide range of events of various spiritual disciplines. We were blessed to have the presence of Anji’s partner Sean on the night, whose people as I found out are indigeneous to Mossman, Far North Queensland, which is close to the place I call home, Cairns. Don’t you just love serendipity! 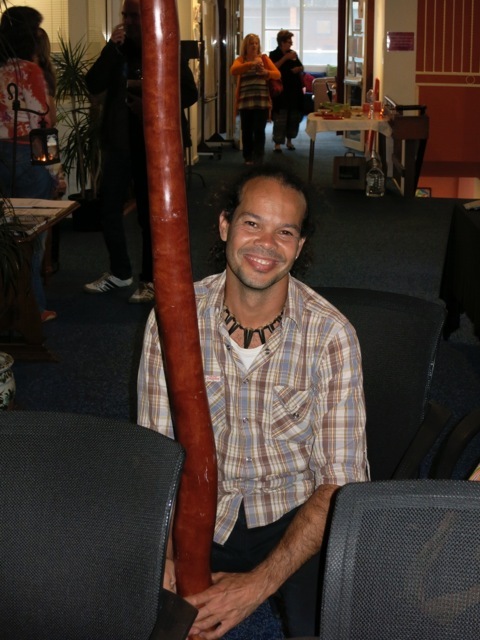 Sean played his Digeridoo in greeting to the attendees as they entered the sacred space. He also offered us a official ‘Welcome to Country’. 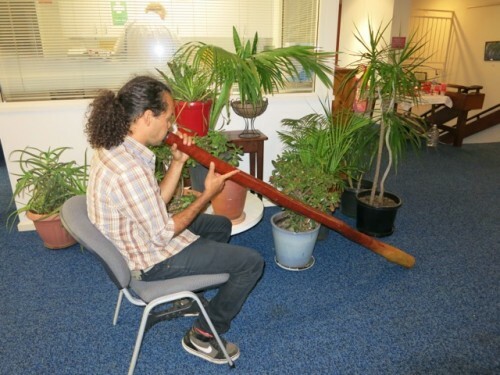 It is my practice when possible, to given acknowledgement and respect to the Traditional custodians of the land, so it was an honour indeed to receive this personal Traditional welcome and blessing on our proceedings. It was a lovely surprise also to find out from Sean just before the event, that the local Bondi tribe are the ‘Whale People’ – the Whale as their totem! It had been absolutely no accident then, that I’d felt the call of the Whales on our approach to Bondi. 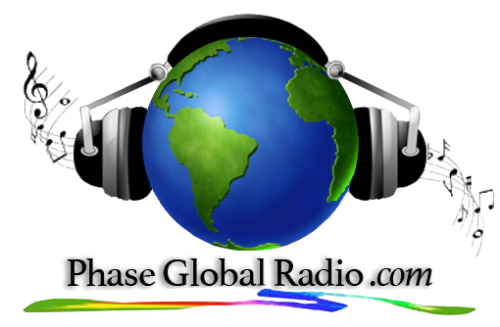 This was a profound confirmation for me of the perfection of choosing to anchor the Divine Sounds of Source energies in this particular location. I think the photo below says a lot about the energy present on that night. 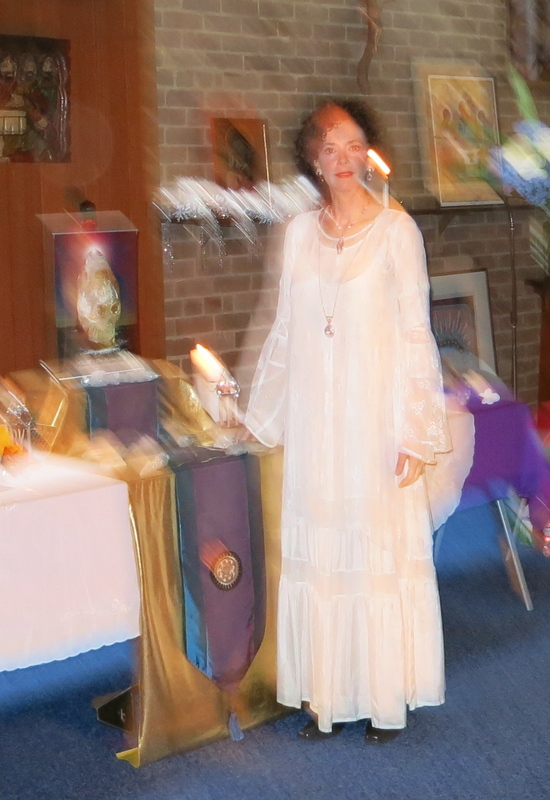 At a several previous events I’ve facilitated, a sort of dimensional bleeding has appeared in many of the photos taken. Something similar I think, is happening here also. I don’t believe this is simply a shaky hand on the camera. 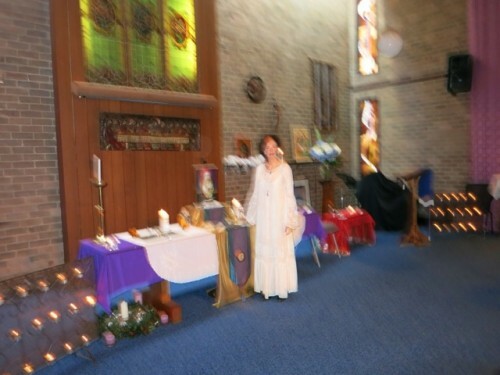 Have a look at the distinct ‘energy aura’ around myself, Solar’s poster and the candelstick for example, as well as the huge circular orb hovering just above Solar’s head! This close-up might help you to see it more easily. 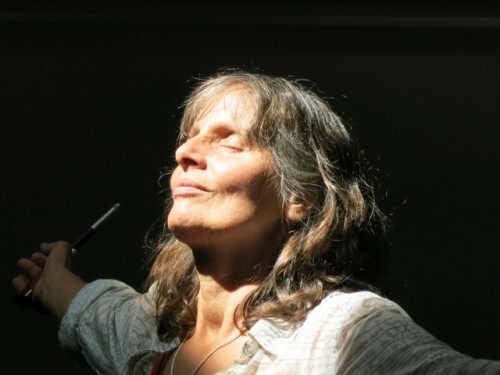 When I hear words such as these from people, my heart is full….To seen the light of joy, reconnection and awakening in people’s eyes at these events, is the greatest reward I could ever receive. 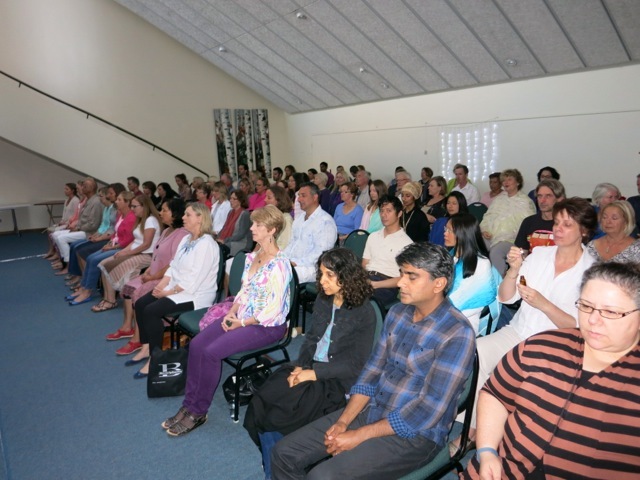 Sunday 1st December brought the dawn of the final event in Crow’s Nest in Sydney’s north. From all the indications even before I arrived in Sydney, Sabine, Lilo and I had the feeling that this was going to be the biggest of the four events. We weren’t wrong! Ninety people or more flooded into the Crow’s Nest Community Centre – about double the number that had actually booked! Several of those had already attended one of the previous events and were back for more! The placed buzzed with excitement as people took their seats. For Sabine, Lilo and I that excitement had been building for hours. As usual, the Sounds of Source energy was ‘trailed’ to the venue. As soon as Sabine picked me up from my appartment in Paddington it was ‘on’! The songs and Light Language flowed non-stop till we arrived in Crow’s Nest. Lilo was the official host of this event. Following her initial gut instinct that this event was going to be a big one, she had, at very considerable cost to herself, decided to rent a very large room in the Crow’s Nest Community Centre. Thank you again Lilo for your very generous commitment to Spirit. In the midst of unpacking the many boxes, arranging trestle tables and chairs, working out sound system requirements and planning how we could beautify the place, I suddenly got the strong message that we needed to drop everything and concentrate instead on consciously setting the energy in preparation for what was about to occur. I became aware of a bright stream of sunlight flooding through the large skylight just above where we had decided to make the main altar. Standing directly under this bright stream of Light, we joined hands and presented our upturned faces to the luminous solar rays. A key aspect of the Sounds of Source Tour is my offering myself as a conduit to bring through the sacred sound codes needed at this time, to assist people with the physical, mental and emotional fallout from the massive increase in solar flares and radiation. As we stood there under the streaming light, it felt to me as if the sun itself was giving us a specific blessing and indeed gifting us with those very codes in Light form, directly our bodies. Another Being then made his presence powerfully felt. The potent energy of ‘The Master Skull Solar’ seemed to descend upon and fill the room. As I acknowledged him and asked for his assistance, my channel opened and the sacred sound codes cascaded through. It was such a beautiful moment…a profound blessing on the three of us, and a sealing of the bond that had been forged through the entire Sydney ‘Pillar of Light’ project, which would reach its completion in the following hours. The practicalities of preparation however still had to be attended to, so we reluctantly dragged ourselves back into 3D reality! Sabine lingered to bathe in the energy a moment longer and when I saw the beauty of her upturned face in the light, I felt the need to freeze it in time. This image speaks volumes, capturing as it does the sweetness of Divine energy we had just experienced. There was an absolute feeling of excitement and Joy bursting from everyone at this event! Many people came with friends, so bubbles of laughter and lots of chatter emanated from the room. Several people said they’d only heard about the event at the last minute but just knew they had to be here. It felt like a party – a celebration! Lilo had even brought some Christmas decorations which added to the festive party atmosphere! Mind you, she also compared the Sounds of Source experience to the commitment of having a child – once you’ve said yes, it’s too late to turn back! She said if she’d known at the outset how much time and effort would be involved in mounting the four events, she might have had to think twice! She was joking….I hope??!! I for one, knew for sure that it was absolutely all worth it. The energy in that room was palpable, powerful and enfolding – a joyous celebration of human family and of Spirit. And I think it’s safe to say most people present felt the same LOVE expressed by Jessica in these following words. People stayed around for ages, sharing experiences and soaking up the energy. But even after everyone had finally left and we had completed the final big pack-up, Spirit had not quite done with us yet! Four of us remained – Sabine, Lilo and our new friend Despina. 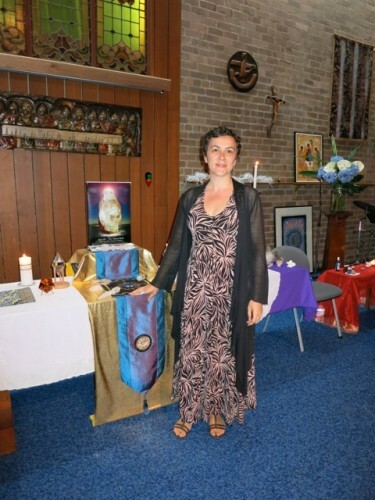 Despina had arrived early at the first event in Annadale, saying that on hearing about it she had felt compelled to be there to offer her services however we might need them, and by the end of the night she ‘knew’ she was meant to return to all three of the other events. Exhausted but happy, we gathered together for a group hug of gratitude and farewell. As we stood in that circle of four, arms around each other, the energy of Spirit descended upon us once more. A spontaneous ceremony ensued, laced with both laughter and tears. It was a sacred moment that seemed to reverberate with the echoes of ancient times, when we had perhaps stood as priestesses together. My heart felt wide open and I knew with certainty that it was complete. The Sydney Pillar of Light was now fully anchored…it was done. Parking: Parking is available in the front carpark or in surrounding streets. Public Transport: Veolia Bus Route 972 ~ Miranda – Frank Vickery Village – Sylvania Waters – Southgate – Kangaroo Pt (with connections to Hurstville). Click here to download timetable and route map. Parking: There is on street meter parking as well as a parking station in the area. Bondi is a busy spot however, so it would be advisable to get there early to secure a parking space. Carpool with friends where possible or another option would be to take the bus from Bondi Junction! Option 1: The 333 pre-paid bus and 380 & 381 buses from Bondi Junction stop in Campbell Parade near Hall St, very close to the Roscoe Street Mall where the Chapel is located. Option 2: The 389 bus from Bondi Junction stops at Glenayr Ave near Curlewis St. The Chapel is approx. 400m from the bus stop. Time: 5pm – Registration from 4.15pm. Hume St /Holtermann St /Nicholson St /Alexander St. All 4 Parking stations are open 24hrs and FREE on Sunday! (Holtermann parking station is right behind the Centre). Public Transport: The Centre is on bus routes between the City and North Shore and from the Manly and Ryde areas, and is a 10-minute walk from St Leonards train station.